Michael James Hinde selected this land that runs along the Nerang River in 1879. While walking from there to visit the woman who was to become his wife, he found some native macadamia nut seedlings which he replanted on the property that he had named Colliston. He was principally an orange grower, but when his orange trees started to decline in the 1920s he planted macadamia trees in-between the orange trees. The macadamias came from those original seedlings. 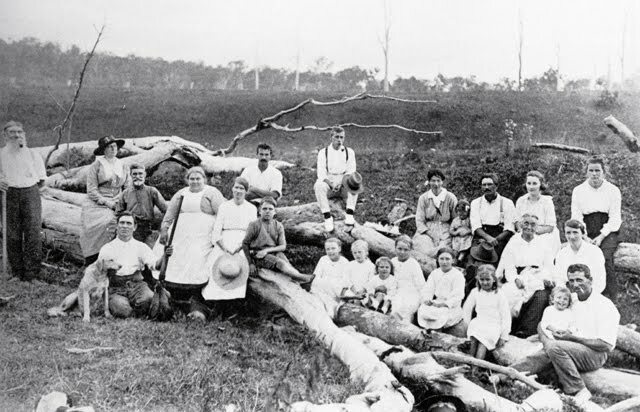 Commercial macadamia plantations began to emerge in the early part of the twentieth century in Queensland. A small orchard of about thirty trees was established on Colliston. Some co-operation developed between the Hinde family and the state department of agriculture on the cultivation of the trees as well as their potential for commercial production. MJ Hinde's brother George also provided an article for the Queensland Agricultural Journal that showed where the trees grew natively around the Gilston area. There were three species of macadamia tree growing on Colliston, and one outshone the others for commercial use. It became known as the H2 Hinde tree. The H2 Hinde tree on Colliston is the parent tree from which all other clones of this variety were propogated. 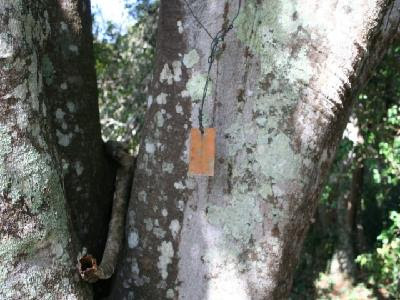 The H2 Hinde variety is the dominant stock kept by nurseries, and it is estimated that 90% of all grafted commercial trees stem from this species of macadamia. By pure chance, over Easter I was visiting some friends who have relatives in the macadamia nut business around the Glasshouse Mountains. I had an opportunity to ask about their trees - every one of them is an H2 grafted plant. The photo above shows a large family group at a picnic at Gilston around 1927. Fourteen of the group are Hindes, and the figure at the left rear of the photograph is George Hinde. Thanks so much for posting this and directing me to it. Michael James Hinde is my great great grandfather. My dear nanna, who passed away only a few years ago said that he was a lovely man. She was incredibly proud of being a Hinde descendant. It is wonderful to know that his legacy lives on. He originally came from buckinghamshire and came here with George as a free settler. His parents Thomas and Sarah later followed. I have been told that he was also the first person to keep bees commercially, too but I am yet to find more evidence of this. hello brissiemum, My daughter found your comments here. My great grandfather was George. Went to the garden centre the other day and bought a macadamia tree and it has the H2 seedling tag on it !!! I have another photo very similiar to the one above showing the Hinde families. Michael James Hinde was my 2nd great grandfather - guess this is where I got my appetite for macadamias!!! (now to find out where the cashew nut taste came from) - great insights into the family history!!!! Thank you to the Hinde family descendents who have commented here.